Let us imprint your corporate, club, or derby logo in full colour. Our multicolor imprinting equipment can reproduce your logo with amazing detail guaranteed to dazzle everyone. Production time is only 7 - 14 business days and we do not charge a setup fee. Minimum order is only 25 blades. The above samples are size 4 Willowleaf blades. You must provide us with a hi resolution digital file with your logo. We do not design your logo. Price includes one digital mockup emailed to you for your review. There is an additional fee of $10 per each additional emailed mockup. high resolution image (JPG, TIF, GIF, PNG). Bitmap images that start out as low resolution graphics cannot be saved at a higher resolution. 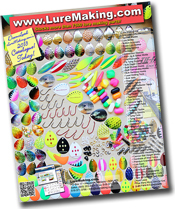 Low resolution images will lower the quality and clarity of your finished lure. Minimum font size is 6 point. If you do not have digital artwork available an additional fee (usually $45) will be charged for artwork.